1. I just added a new contact but I don't find him when doing the seating assignment. The Contact List is different from your Banquet's Invitee List. You have to add contacts to your Banquet's Invitee List, you decide of this universe of people you know who will be invited. To do it, just tap on the plus icon located at the top left corner. A popup window will display all the contacts that are not in your current Invitee List. Just tap on the pick button to add him. 2. How do I synchronize my Facebook event to myBanquet ? This option only works if you imported your Facebook friends into your Contact list. To synchronize your banquet invitations, go to Options/facebook connect, and tap on Login to Facebook. Once connected, pick the event that matches your banquet. 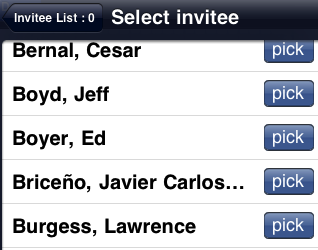 If a guest is not in your Invitee List, the system will automatically add him/her. If you picked the wrong event, you can change it by tapping the Change Event button. 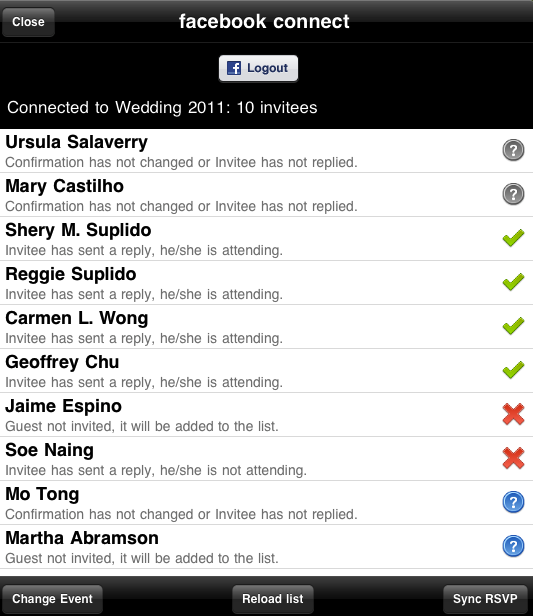 myBanquet will load all the actual RSVPs from Facebook, tap on Sync RSVP to update your Invitee List.